I remember this photo like it was yesterday. 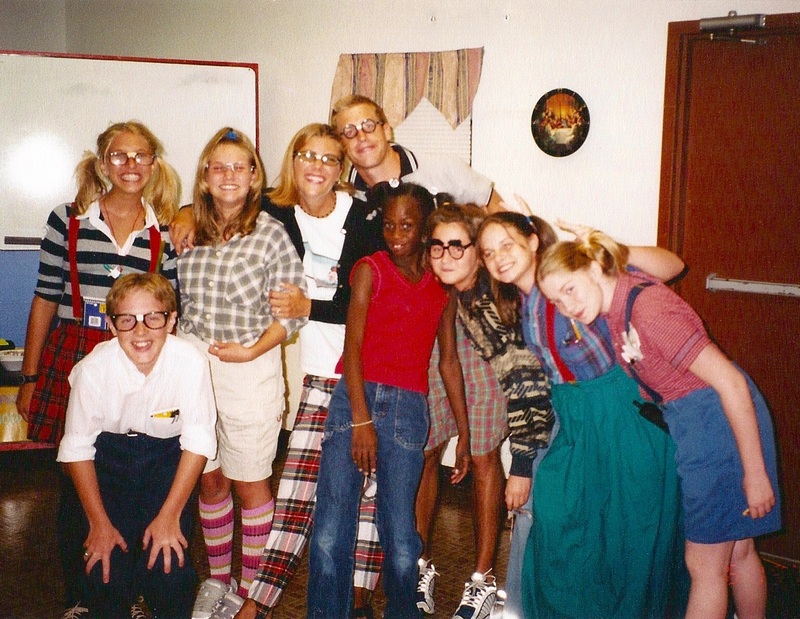 The beauty that was 2002 and my second year in youth ministry. I had gone to the thrift store to buy some nerd pants. (Not realizing that I had plenty in my closet already, I spent $1.85 on another pair.) 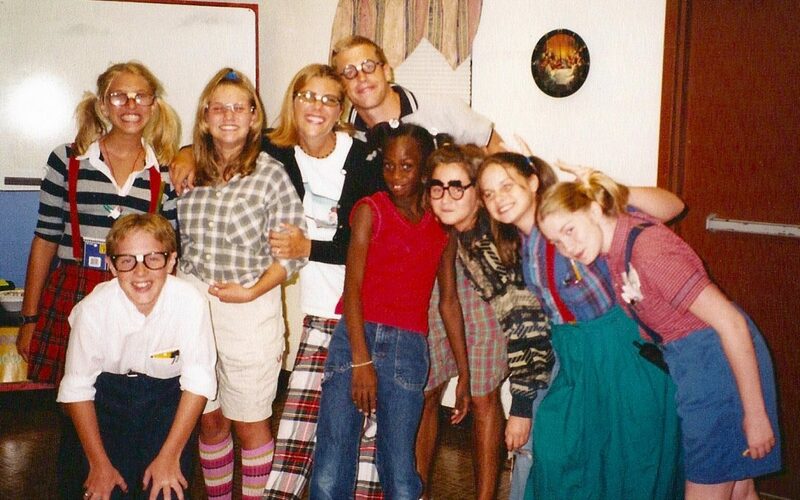 Our youth group was two dozen strong, the perfect size for my husband Coy and I to know them all. It was nerd night because we needed something fun to do. It’s tough not to be sad when you are preparing to say goodbye to your seniors. I had known them BOTH for an entire year. They were special, mostly mature, and also had an ability to drive for us. I couldn’t even imagine how we would survive without them (their cars). So, John and Robert were graduating. And we were celebrating with all the nerd we had within us. They were off to college with occasional visits around the holidays or one might return for a day to go to the beach with us. It’d be easy to wish for those days. But I can honestly say that every year in youth ministry has been one that I’ve missed in different ways. There’s no way to compare the season you just had with the season that is coming because you don’t know who will come into your life next. Every kid, every teenager, every young adult that you have the blessing of getting to know helps your faith grow. I think it’s absolutely our role to be a spiritual director, mentor, friend, help, leader, pastoral voice, ride home, has the $5 they need person. But I also think it’s absolutely impossible not to benefit when we experience the image of God new, differently, uniquely with every single kid we meet. And that changes how I feel about the next season of youth ministry. what do I get to learn about God next? Then, I hug the one’s on the way out, offer them the best happy youth pastor face I can, promise to pray for them and then step into the wonder of what’s next. Every single person we get to serve is a person who can show us the face of God.